Gmail: Gmail puts a profile card next to the e-mails you read that are from other Google+ users. The card gives detailed information about previous interactions you’ve had with the individual through Google+. Google Reader: Google Reader lets you share articles right to Google+ (through either the Share link or the shortcut key sequence Shift+S). You can also +1 articles you like, improving their rank amongst your friends on Google.com itself. YouTube: YouTube is gradually integrating more and more with Google+. For instance, when you click Like on YouTube, you see a Google+ Share link that lets you +1 and share the video so your friends can comment on it and share it. YouTube will probably expand quite a bit in the future, embracing the Google+ social layer. Perhaps eventually the YouTube the Subscribers option will cater just to Google+ followers; then each YouTube channel would become its own Google+ Page. It’s hard to tell in what specific ways these changes will happen, but you can bet YouTube will get more and more integrated in the future. Google search: Google search and Google+ together are referred to as Google Search Plus Your World. Google Search Plus Your World starts with the column on the right, which shows people in your circles and recent Google+ content from your friends that matches your search query. +1 any search result in the main search. 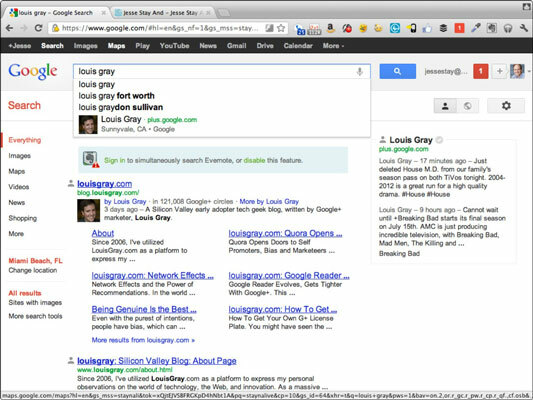 See the Google+ profiles of authors with properly associated content. In certain cases (defined by an algorithm that only Google knows) you can add authors and websites (through their Google+ pages) to your circles. Google Chrome browser: In Google Chrome, if you want to use an extension to +1, share websites, or see your notifications on any website, you must have the extension. There’s no telling where Google will take this option in the future, but it wouldn’t be surprising if the +1s and notifications you get from Chrome extensions end up directly integrated into Chrome. Only time will tell. Google Play: Google Play is Google’s marketplace for media and apps. When you mouse over media, a Share button appears. Clicking the Share button allows you to share things like music to Google+. In addition, Play lets you +1 albums and shows you which of your friends have +1’d each album on the site. Picasa web: Google has been integrating its photo-sharing service, Picasa web, into Google+ photo sharing and storage. Every photo you post to Picasa web is added as a private photo in your Google+ photos. You can then change the permissions of the album for that photo to a privacy setting in Google+ you are comfortable with. 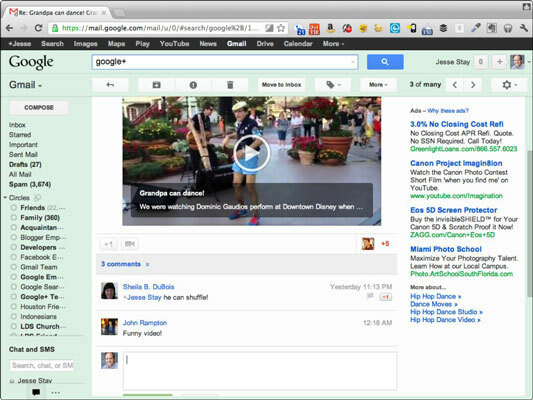 Blogger.com: As an avid Blogger.com user, it’s good to see Google+ get more integrated with this service. Blogger.com can prompt you to share each post you make on the service. Google also provides Google+ Badges and +1 buttons for people who host their blogs on the service.